The political front is stalemated, and the occupation grinds on—but some Palestinians are creating their own facts on the ground. Labor leader Hatem Abu Ziadeh has quietly made history. In February, the 45-year-old Palestinian father of six from Jericho sat down with Morris Zarfati, the owner of the Zarfati car-repair garage in the Mishor Adumim Industrial Zone in the Israeli-occupied West Bank. For years a “war” had raged between the two men following Abu Ziadeh’s unionizing work and subsequent dismissal from the garage. Now, over tea and smiles, they came to a collective-bargaining agreement that improved wages and working conditions for Abu Ziadeh and his fellow employees, a first for Palestinians working for Israelis in the West Bank. Support for this article was provided by the Pulitzer Center on Crisis Reporting. 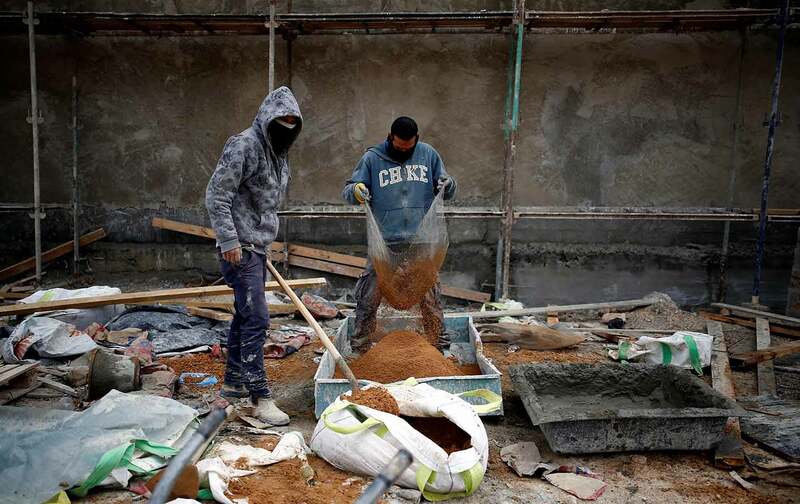 The Palestinian labor market, after all, is subsumed under the Israeli occupation. About 70,000 other Palestinians work in Israel through expensive and hard-to-procure work permits, according to Israeli government figures. Palestinians can pay up to $700 (2,500 Israeli shekels) a month for a permit to an Israeli or Palestinian middleman (or about a quarter to third of the average laborer’s salary), found a recent study by the Israeli finance ministry—the first government report to document this long-standing exploitation. In theory, after repeated security checks, Palestinians who qualify receive a permit sponsored by a contractor to work in a specific sector; in practice, however, permits are traded between contractors and middlemen and Palestinians, which negatively impacts wages and competition. An estimated 50,000 more Palestinians work illegally in Israel, according to Israel’s military. They sneak through checkpoints or over the separation wall to toil despite the risks, often staying illegally in Israel for as long as they can to dodge authorities. Abu Ziadeh’s work permit—which the garage’s management at one point revoked during its efforts to stop the unionization drive—only allows him into the industrial zone, and doesn’t let him cross a checkpoint into Israel. But in 2007, an Israeli court ruled that these disputed areas are indeed part of Israel—at least as far as labor laws go. (Palestinians in the West Bank live under military rule, unlike those in East Jerusalem, which Israel annexed after capturing it from Jordan in 1967; the international community does not recognize the annexation.) That means that Israel’s relatively strong labor protections, like the minimum wage and the right to unionize, apply to Palestinians like Abu Ziadeh. But it has taken a decade for Abu Ziadeh and his roughly 70 colleagues at Zarfati garage to become the first to capitalize on those rights. And they’ve encountered barriers at every step. Most notoriously, the garage fired Abu Ziadeh in 2014 for his unionizing and later alleged that he had intentionally damaged an Israeli tank he was fixing during that summer’s Gaza war. He was rehired 21 months later, after the allegations were discredited and an Israeli judge ordered him reinstated. Overall, WAC-MAAN paid about $20,000 in legal expenses to get Abu Ziadeh reinstated, according to Tamir. Under the new collective-bargaining agreement, the employer covers the remaining legal fees. Each employee also receives an average compensation of 35,000 shekels (nearly $10,000) for lost payment. Going forward, the workers will get vacation and sick days, as well as a minimum wage (and, at last, official pay slips), with a structure in place for pay raises based on years worked. Not all Palestinians welcome the help from Israelis like Tamir, which runs afoul of the Palestinian anti-normalization movement. The Palestinian Authority has even forbidden Palestinians—if only symbolically, since the PA has no enforcement mechanism—from working in Israeli settlements and industrial zones. Unionization also threatens the status of middlemen, who can earn a princely sum procuring coveted and costly Israeli work permits. The Palestinian General Federation of Trade Unions, itself a complicated and political body, has no jurisdiction in Israeli settlements. Still, Abu Ziadeh continues to spread the union gospel. Across Israel, unionizing has been on the rise since the 2011 social-justice protests against the high cost of living and the passage of pro-union legislation. The once nearly all-powerful Histadrut, Israel’s largest and state-aligned trade union, is now trying to rebrand itself, after years of decline, as a workers’ organization that transcends Israel’s religious, racial, and geographic divides. But Histadrut never returned Abu Ziadeh’s calls, so he turned to the newer WAC-MAAN instead. He’s now working to educate more workers about their rights. A couple of a months ago, 20 carpentry workers, also from the Mishor Adumim Industrial Zone, became the second group of Palestinian laborers to officially unionize, and like Abu Ziadeh and his fellow workers, they did so through WAC-MAAN, according to Tamir. How far economic grievances—and there are many among both Israelis and Palestinians these days—can go in reorienting political interests toward worker solidarity across national and religious lines remains to be seen. But labor organizing now has a lifeline at a time when creativity on the Israeli-Palestinian political front is depressingly low and questions over the future of Israel’s settlements loom large. In the meantime, Abu Ziadeh is not holding his breath for any politician to end the occupation. His union is creating its own facts on the ground. Miriam BergerMiriam Berger, a freelance American journalist currently based in Jerusalem, has reported on labor issues from around the Middle East.